While planning for the weekend cooking, I thought I would make something new and asked Hubby dear what he wanted. He remembered his Aunt, who is a wonderful cook and wanted me to ask her for ideas. She was the one who shared the Fried Keema Balls, Keema Kofta Curry when we had gone to my SIL’s place. I called her up to know if she knows a newer version of biryanis, she was all praise of her daughter who lives in Hyderabad and asked me to talk to her. 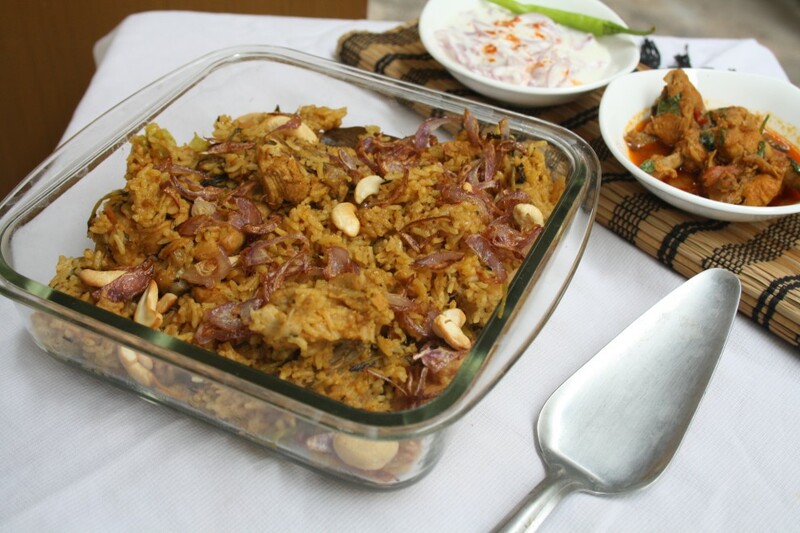 Well finally it lead me talking to her daughter who shared this Hyderabadi Style Chicken Biryani. I specifically asked her if there was a said thing that tomatoes are not added in Hyderabadi Biryani. She said they make it both wise, with tomatoes and without and also in Dum Style and in regular cooking method. The procedure is quite long, the end result though makes it all worth is what she said. 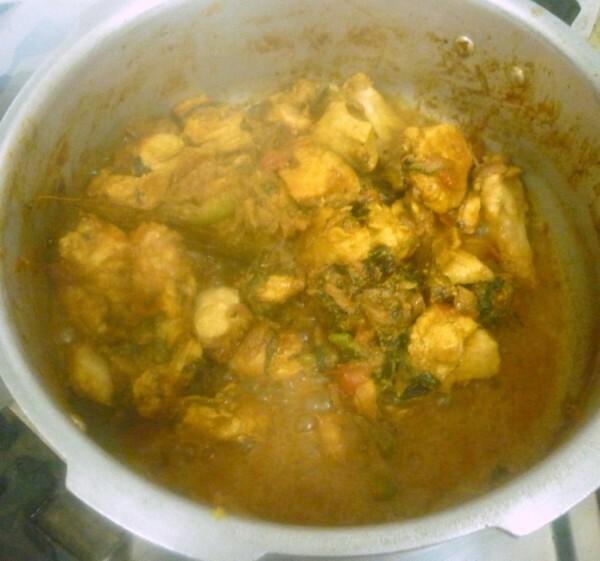 I set up making it and ended up making in Pressure cooker. I was so surprised when Konda and Peddu loved this biryani so much. Konda never prefers Biryanis and it was a real treat that I have finally have something that she likes so much. So this joins yet another array of biryanis that has to be noted down. 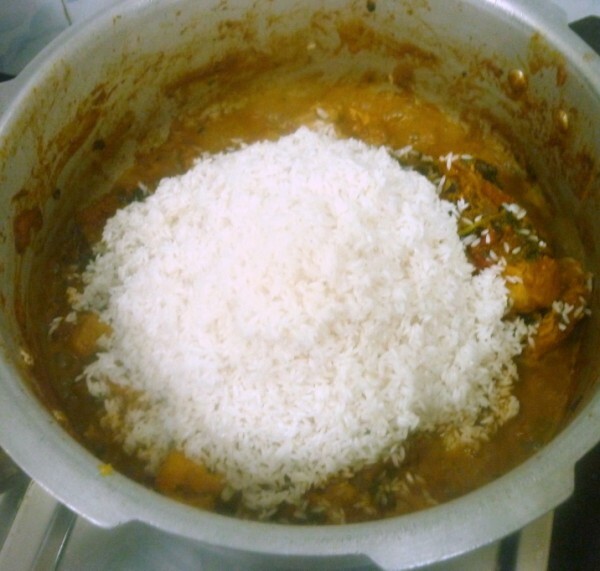 I made this in pressure cooker and you got to be really careful about the water as you add water in couple of steps and I ended up using another method which takes care of excess water as well. 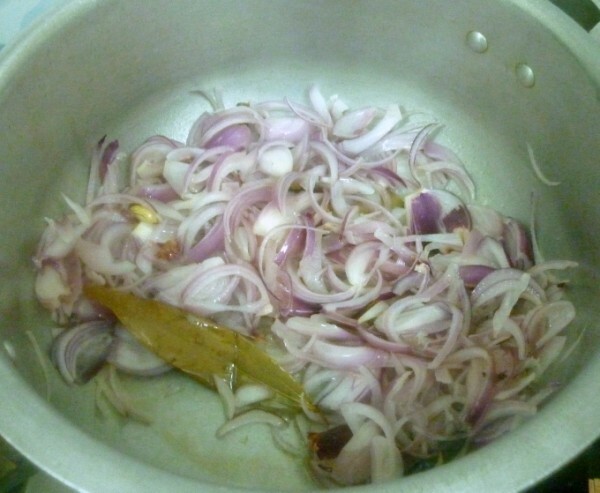 I was told the specialty in this biryani is the amount of onions added, so much onions are added that it gives a different taste and texture all together. 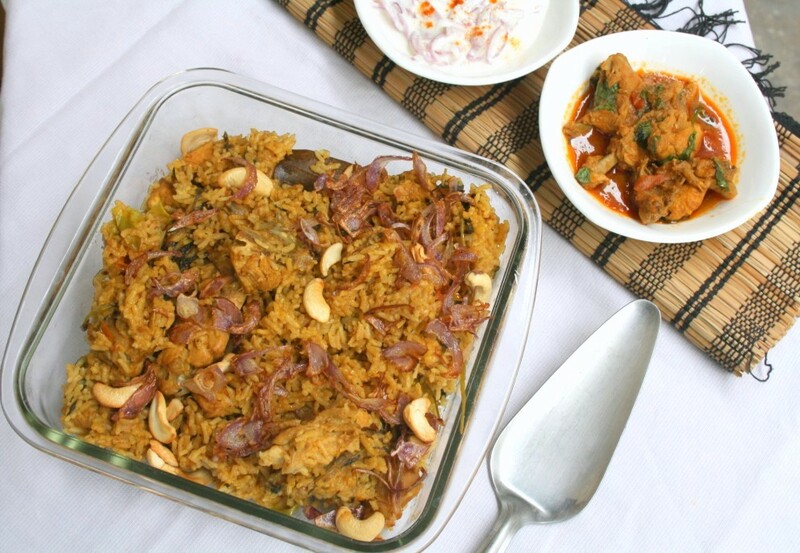 As with the Mutton Biryani that was shared by our Muslim Friend, this biryani uses Methi leaves as well. Maybe someday I will try out a vegetarian version of this and taste it myself! 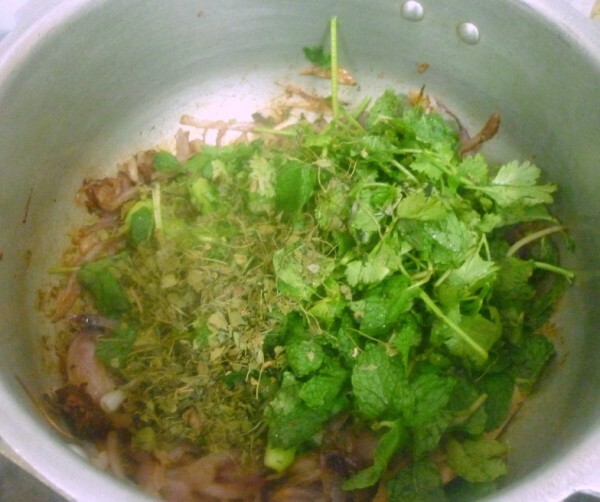 In a bowl, marinate along with the ingredients listed for marination for about 30 – 40 mins. 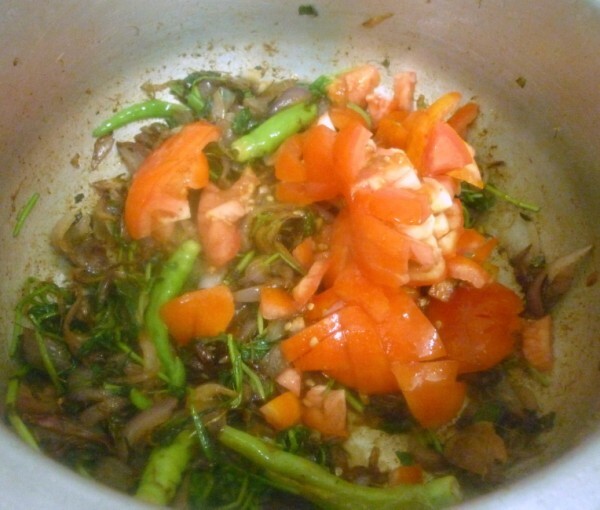 In a pressure cooker, add oil and saute the whole garam masala. 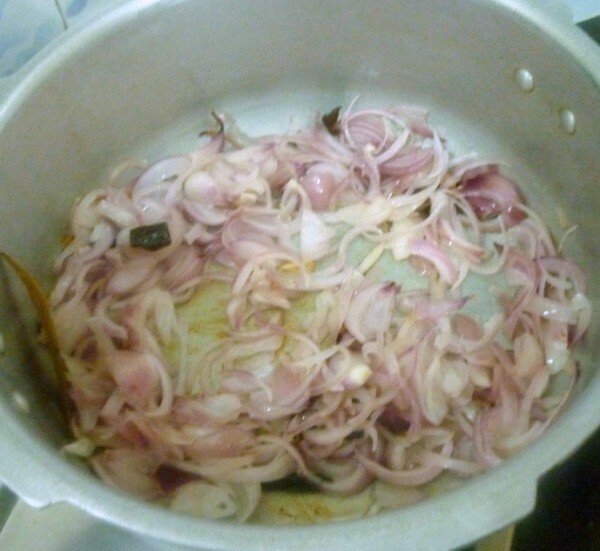 Then add onion julienne and saute till they turn colour. Next add the ginger garlic paste and continue sauteing. Add slit green chilies. 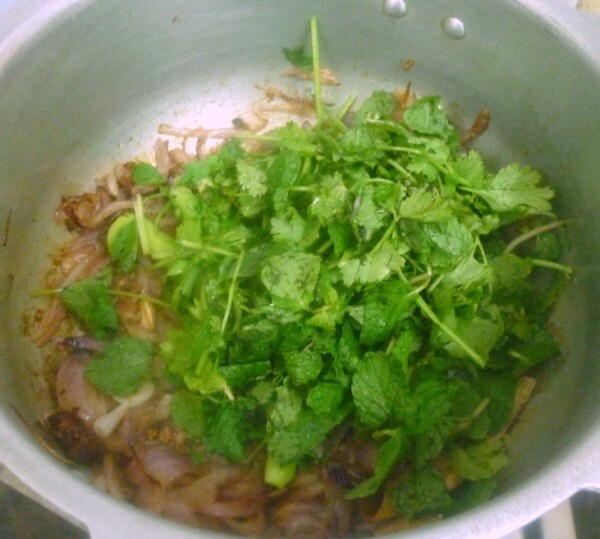 Now add the chopped coriander leaves, mint leaves and Fenugreek leaves. Continue cooking in simmer. 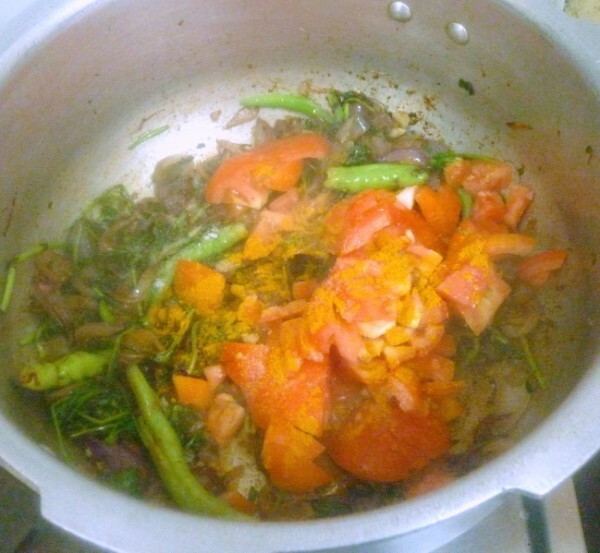 Now add tomatoes, salt and cook till the tomatoes turn soft. Next add the chili powder, coriander powder, cumin powder, turmeric powder. Cook for 10 mins, till the oil comes out on the sides. Make sure you don’t let the bottom brown. 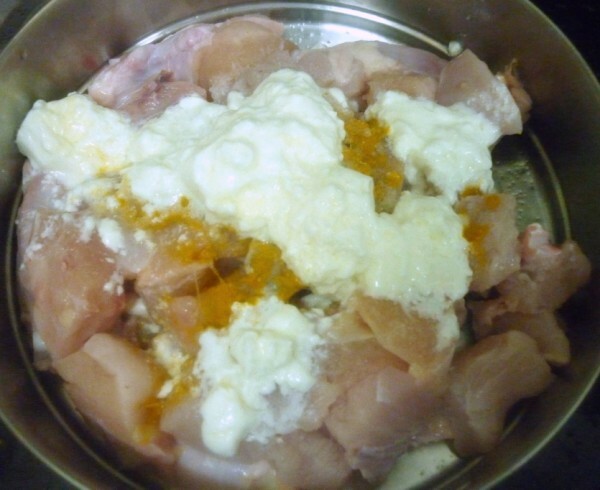 Add the chicken marinade along with the liquid. Cook till the all the moisture is evaporated. When all the water is evaporated, add the coconut powder. Mix everything well. Drain the water from the rice and add to the pan. Combine everything well. 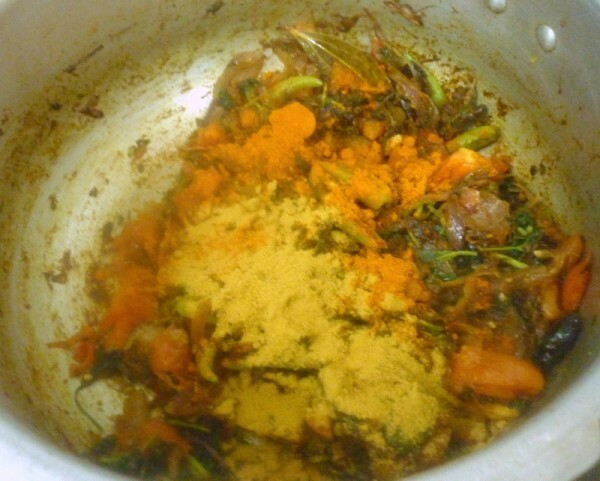 Add the clove powder, water and adjust salt. Cover with lid and cook for 2 whistles or simmer for 10 mints. 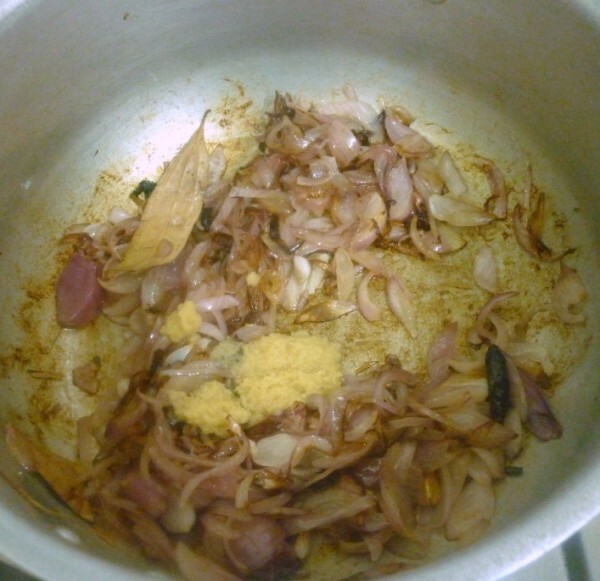 For the garnish, roast the onions to crisp brown along with cashew for final garnish. 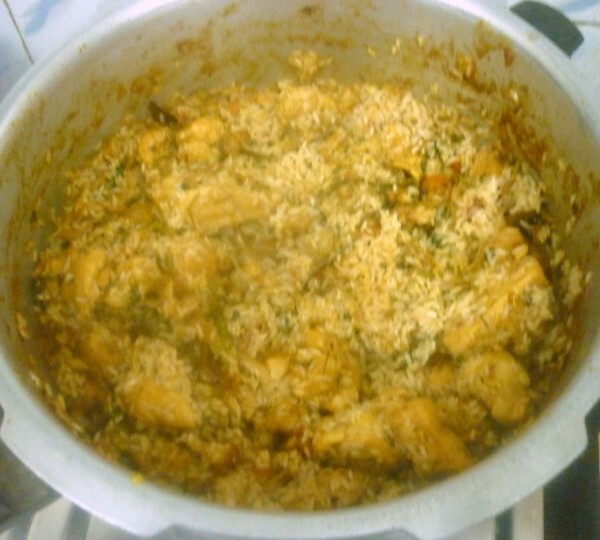 If you plan to make this biryani in Dum, Cook the rice to half boil and keep it aside after draining the water. 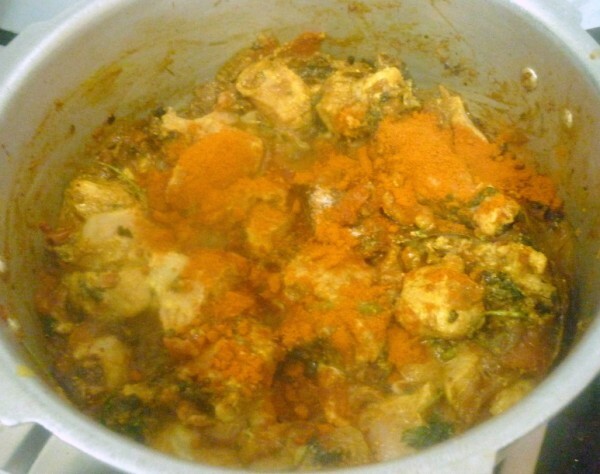 Cook the chicken gravy as per the above method, make sure the chicken gravy is almost dry. 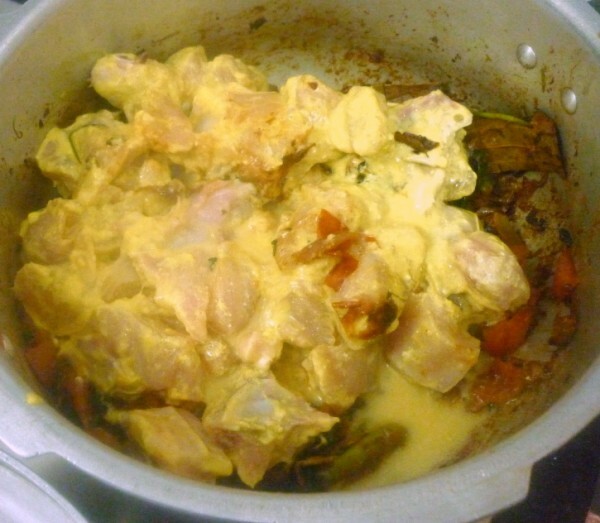 In a thick bottom pan, layer with rice and chicken gravy alternatively and dum for 30 mins in sim over a tawa. Finally serve with roasted cashews and onions. 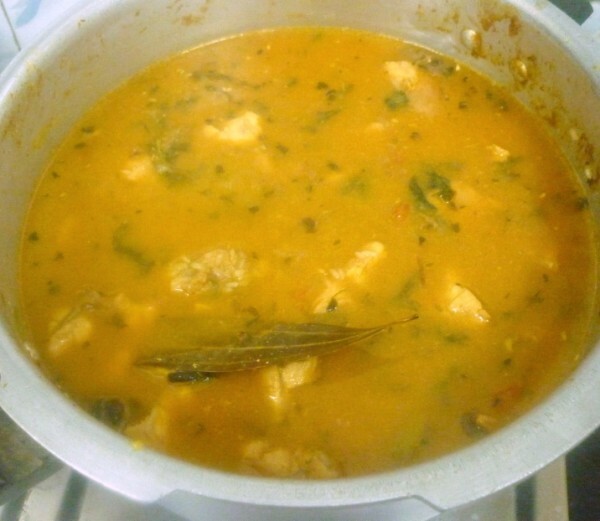 I served with Chicken Gravy Athamma style and a plain Onion raitha. 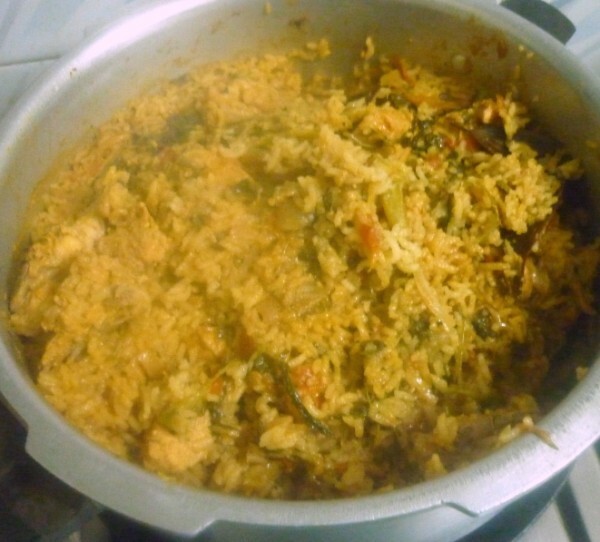 I made this biryani in pressure cooker method and though I added much less than the water I would for 3 cups of rice, the biryani turned soft and mushy. 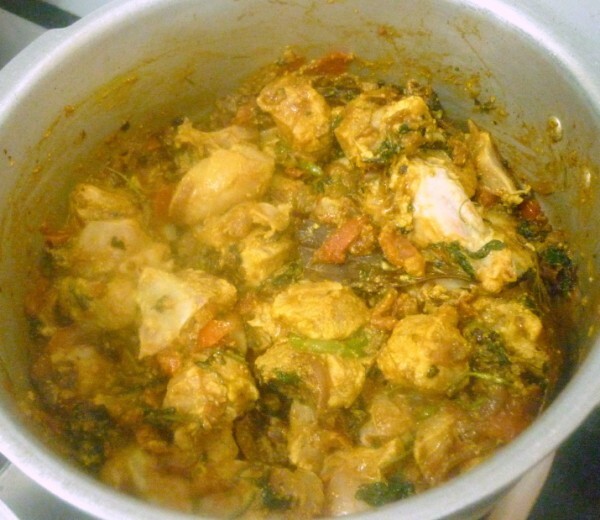 So I cooked it only for 2 whistle, and continued cooking in simmer, while having the pressure cooker over the tawa, covered with 4 layers of newspaper. 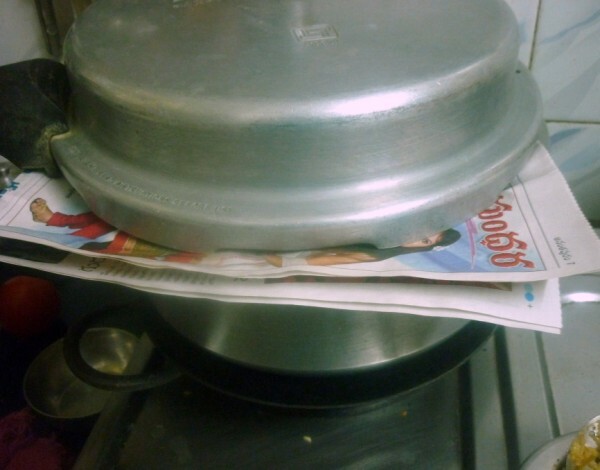 Over the newspaper place a plate that fits it well and then finally place the cooker lid. 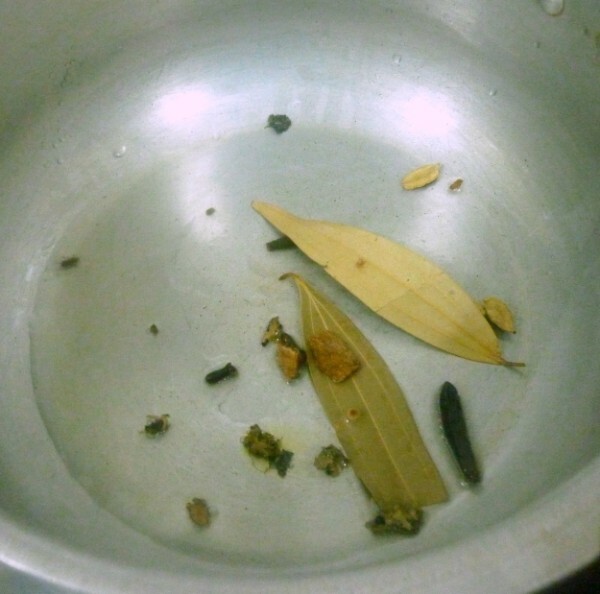 This way the rice gets cooked evenly and the excess water is absorbed by the paper. End of 15 mins, the biryani turned out correctly done. It wasn’t mushy or overcooked. Also since you add salt in two different places, please check after adding water. 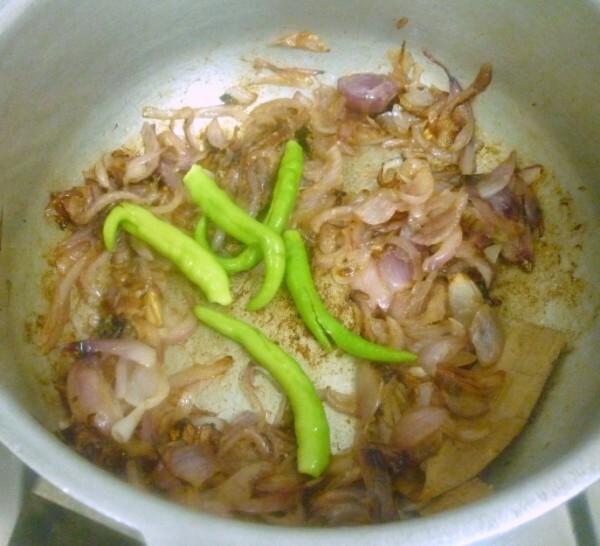 As onions are more, it will tend to become little sweet, so you will have to compensate with enough green chilies and red chili powder. This can be adjusted even after added the water at the end stage. 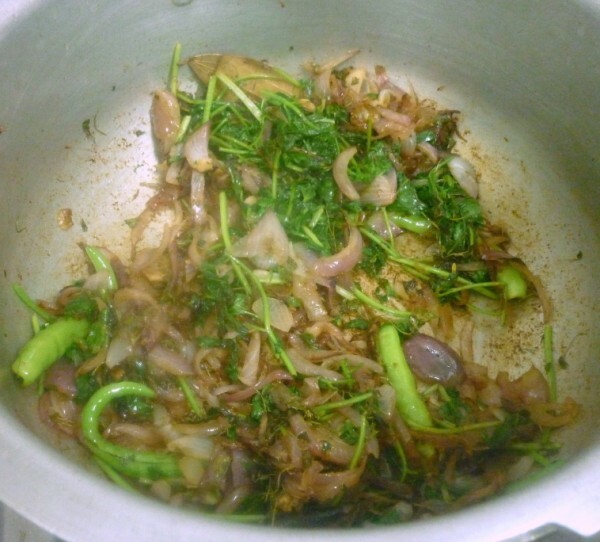 I couldn’t lay my hands on fresh methi leaves and used kasuri Methi instead. Maybe this could have been the reason for the slight bitterness that was felt by Athamma, though as always kids didn’t know it. Delicious and flavorful Biryani.. Looks very inviting. 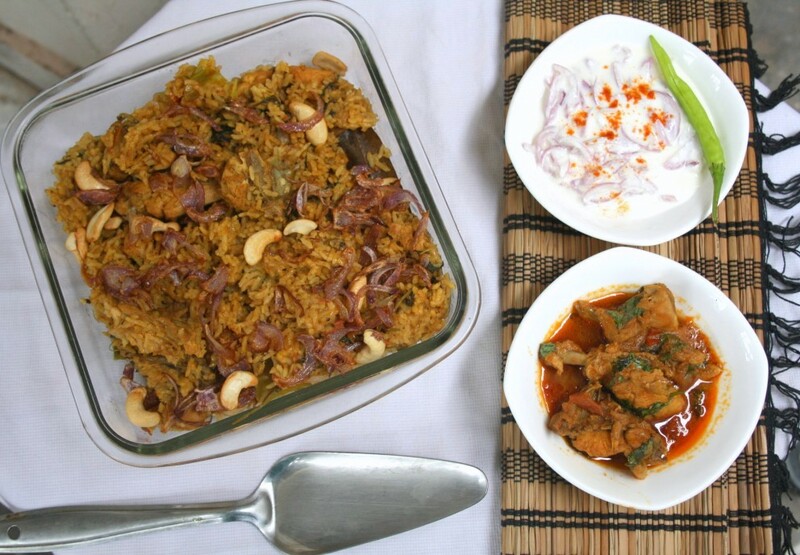 Whoa iam literally drooling on seeing the hyderabadi chicken biryani, should be spicy n yum. Wrong time to have come across iam off to hunt the kitchen.